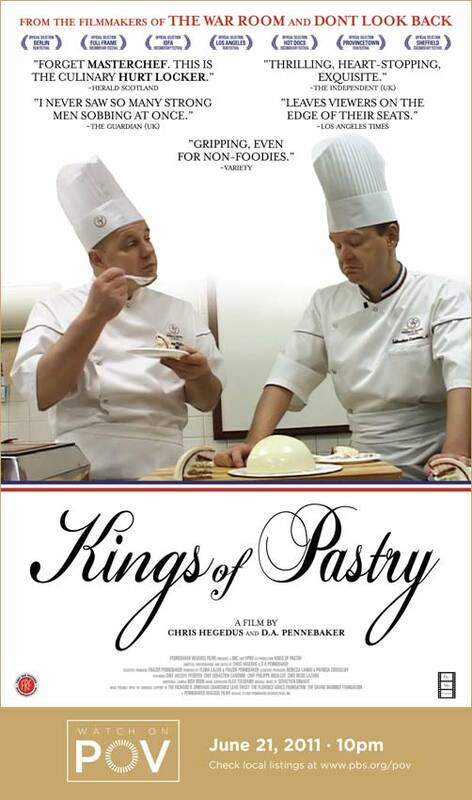 I watched The Kings of Pastry on DVD early November 2011. Work took me away from writing a review about it, until I watched it again last night. 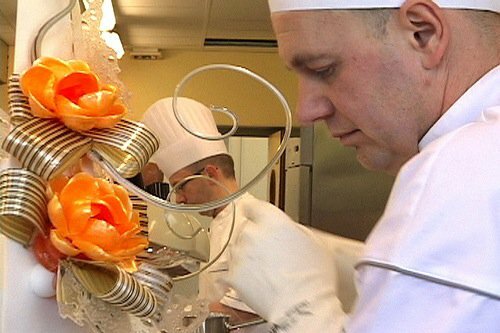 It is a documentary showing 16 harried patisseirs competiting for the distinctive MOF collar which distinguishes them as masters of the culinary art of pastry making. 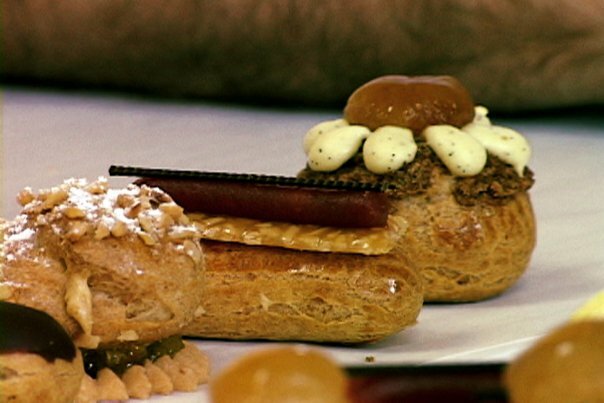 The Kings of Pastry is a 2008 documentary by Chris Hegedus and his wife, D.A. Pennebaker. This was the first time an MOF final was filmed, documenting a Chicago’s patissier, Jacquy Pfeiffer’s participation in this august competition. Jacquy is a co-founder of Chicago’s prestigious French Pastry School. MOF stands for Meilleurs Ouvriers de France, translated The Best Craftsmen of France. The film is a riveting story about 16 finalist chefs vying for the coveted blue-white-and-red collar. The MOF pastissier honour is more than a century old. This illustrious title honours great craftsmanship, giving credence to the hard-work, skills and professionalism of artisans and their on-going pursuit of excellence. During the 3-day finals, viewers could experience the same gruesome “madness” the harried finalists felt. The endless train of mixing, baking, piping, and sculpting manifested the chefs’ masterful craftsmanship executed to the exacting demands and microscopic scrutiny of the judges, who themselves are MOFs. The high energy epitomized every chef’s desire to push to the edge, to emerge a bigger and better talented professional patissier. The wedding theme was chosen for this year’s finals. A list of items was given to the chefs, from which pure artistry and world-class creativity poured. The patissiers created from scratch, in situ, a magnificent array of colourful desserts, delightful jams, sweet tea pastries, delicate cream puffs, tiered wedding cakes and fragile sugar sculptures. 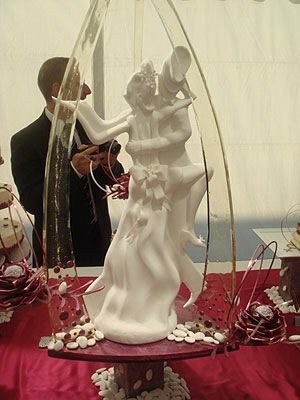 One other item, pre-made off-site, was the ornate bijou, a delicate sugar sculpture. The finals was a thrilling, race against the clock. But, it is during the thrilling, edge of the seat finale of this MOF competition that one feels the commonness of us being human. Unlike the reality TV programmes such as TopChef, Hell’s Kitchen and the like, viewers watching this documentary are warmed by the supportive and sympathetic relationships between the contestants and the judges, them and their mentor/coaches, them and their supporters and family members. Viewers should also come off feeling inspired by the creative geniuses of these 16 patissiers. They are as passionate and consummate as they are tenacious and tastefully imaginative in their creative pastry making skills. MOF patissier is a tribute to the Kings of Pastry. Excellence bar none. 1. 2 good movies: Kings of Pastry (2009) and Patisserie Coin de Rue (2011) blogged on 13 November 2011. The producer of this movie should give some royalties for heavily promoting for them. I should make up some time to watch the second half of the movie really. Thanks jiahoemo [http://gravatar.com/jiahoemo] for “Like”-ing this blog entry. Please come back, from time to time, for more.